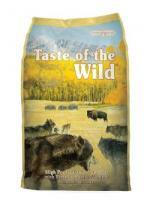 Mansfield Feed Mill is proud to offer Taste of the Wild dog food. Modern science proves that your dog or cat still shares the DNA of the ancient canine or wild cat and their tastes demand something of the wild, Taste of the Wild dog and cat food provides them with all the best nutrition available today. Taste of the Wild High Prairie Canine Formula is a grain-free formula with sweet potatoes and peas provides highly digestible energy for your active dog. Made with real roasted meat, this formula offers a taste sensation like no other. Supplemented with vegetables and fruits, this hearty formula delivers natural antioxidants to help give your friend a healthy lifestyle. Your dog craves a taste of the wild. Go ahead and give him one. This feed is available in 30lb bags at Mansfield Feed Mill. If you have additional questions regarding this feed, please contact us here or stop by to let our experts help you get the right food for your dog. This entry was posted on Thursday, October 15th, 2015 at 3:47 pm	and is filed under Dog, News & Updates. You can follow any responses to this entry through the RSS 2.0 feed. Both comments and pings are currently closed.